Please click here to view a recent article in 'Flying' magazine reviewing the new TBM 900. The TBM 900 with a cruise speed of 330 KTAS at FL280 (in ISA conditions) gives owners and pilots the advantages of the typical cruising speeds of light jets, with the economical direct operating costs of a single-engine turboprop. 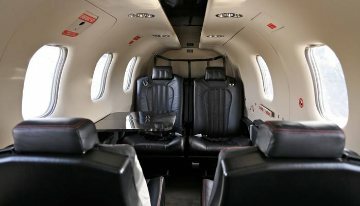 1,730 Nautical Miles is the range of the TBM 900 at long-range cruising speed with 4 people on board. The TBM 900 can fly more than 130 NM further than the TBM 850 using the same amount of fuel. If you want to travel 1,585 NM and reduce your flight by almost an hour, you can do it flying almost 40 kts faster in the TBM 900... This is real efficiency! 330 kts, the maximum cruise speed of the new TBM 900 making it the world's fastest certified, pressurized single-engined turboprop. What's more the new TBM 900 is faster at its maximum cruise altitude of FL310 than the fastest speed of any previous TBM at its fastest altitude. 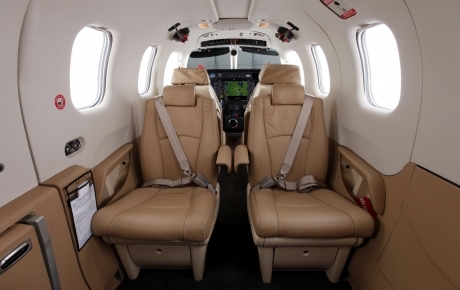 The TBM 900 simply gets you there faster easily and re-imagines the world’s fastest certified single engine turboprop. The TBM 900 benefits from everything that DAHER has learned from the previous versions of the TBM family. The TBM 900 offers even greater speed, range and efficiency than previous TBMs. It has also improved short field capabilities and, as a result, can be used on just about all general aviation runways. Approaching at only 90 KIAS or less, short runways or short unpaved surfaces will accommodate the TBM 900. The new 5-blade Hartzell propeller reduces noise and improves take off performance. The availability of thrust reversal on the TBM 900 substantially improves safety margins over aircraft without these capabilities when flying into shorter fields, (particularly when the surface is wet) allowing landing on extremely short strips and runways safely using less than 1,500 ft. This is very different than the case of most light jets limited by their “hot and high” runway performance. In other words, a runway available to the TBM is simply not available to others or it will require them substantial reductions of cabin and fuel load. With the TBM 900, fly closer to your destination and travel the world while carrying everything you need. The sound level in decibels (dBA) of a TBM 900 during takeoff is just 76.4. Almost 3 db quieter than previous TBMs, the TBM 900 meets the latest European and US noise standards in the quiet category and making the TBM 900 both exciting and eco-friendly! 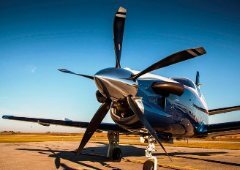 In addition, the new 5-blade propeller which was designed specifically to integrate with the TBM 900s new inlet produces even more thrust and in combination with other performance enhancements improves the take-off distance, climb and cruise speed of the TBM 900. Ahead of the firewall, everything is new; a redesigned cowling with more efficient inlet, a simplified plenum to improve airflow, nozzles access, inertial separator up to VMO and more. Everything is new... except the engine. The TBM 900 is still powered by the proven PT6A-66D, but with all the other improvements, you get the equivalent of 80 more horsepower without increasing fuel consumption. Thanks to the new torque limiter, you can use all of the TBM 900s 850 Hp right from the start of the takeoff roll. Our new exhaust has been redesigned for better efficiency resulting which maximizes the airflow through the engine improving high-altitude performance. The TBM 900 is powered by the reliable Pratt & Whitney Canada PT6A engine. Its proven design offers easy maintenance, efficiency and low cost of operation. It is covered by one of the most extensive support networks. Variants of the PT6A are in use on more than 100 different types of Aircraft. Safety proven, from years of regional airliner and commercial operations with over 43,000 engines in the field (spanning over 350 million flight hours), the PT6A is recognized as one of the most reliable powerplants ever built. The PT6A-66D model used on the TBM 900 has a thermodynamic rating of 1,825 horsepower and a flat-rated output of 850 shaft-horsepower making it one of the most powerful PT6A engines built to date. TBM 930 gets there faster, with speeds of 330 kts./380 mph. This is the latest version of the world’s fastest certified single-engine turboprop. 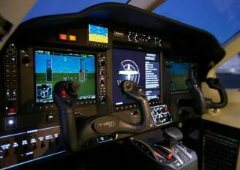 A truly integrated flight deck with Garmin’s G3000. Digital avionics suite – the first-ever touchscreen-controlled, all-glass flight deck designed for light turbine aircraft. NEW GTC 580 It incorporates streamlined menu structures to remove visual clutter and eliminate mechanical knobs, buttons and selector switches. Register now to discover the TBM 900. Click here for a demonstration!